People often need to request a concerned authority or person to carry out an action. This should be done in an organized and systematic manner. It is for this purpose that the action request forms are used. The person filling in the form can list down the action which should be improved and also his suggestions. Using these Action Forms make it easier for the users to fill in and decipher the instructions as everything is written in a systematic fashion. 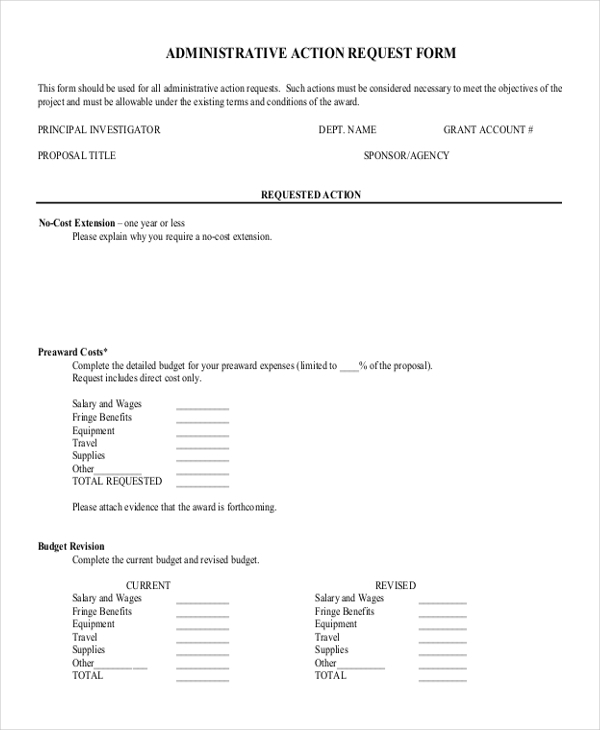 This is basically an intra organizational action request form that can be used by the bosses to point out the problems in certain functions and offer suggestions for the actions to be taken. With all the essential segments in place, this definitely is quite easy and simple. 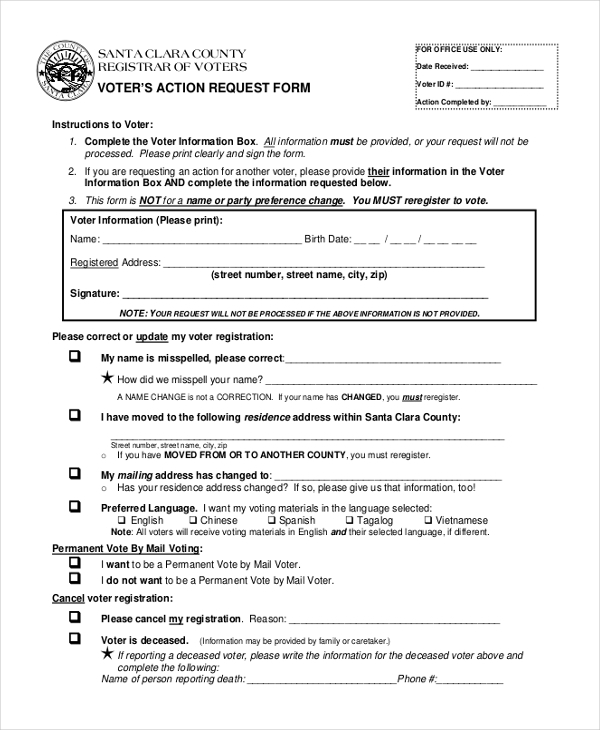 This form is used by government agencies to allow the citizens within their jurisdictions to request for the change or correction of certain information on the voters list. They can list the details in this form and submit it with the authority concerned. 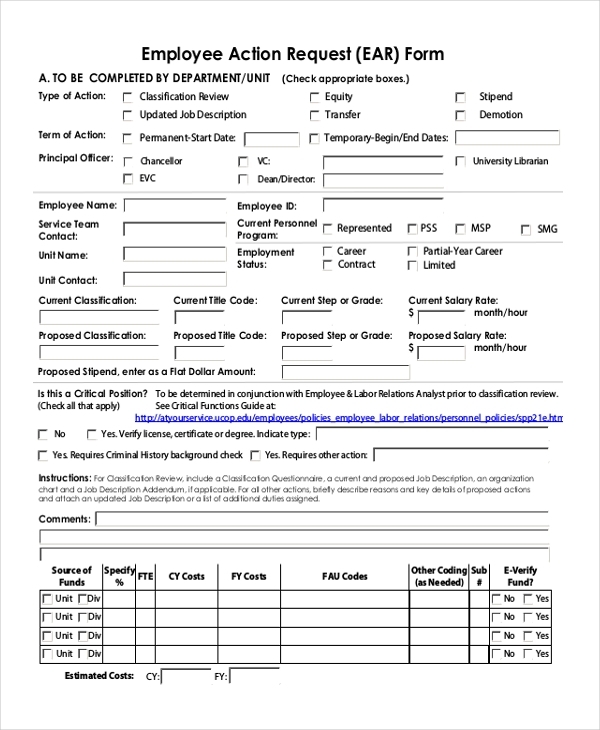 This form is generally used by educational institutions and business organizations to allow their personnel to request for certain actions to be taken in their favor. This could include anything from request for a transfer to request for special provisions.You may also see Lease Purchase Agreement Forms. Business organizations make use of this form to announce a particular action that would be taken in favor of or against the employees. The user is required to fill in the employee details and then select the action to be taken. 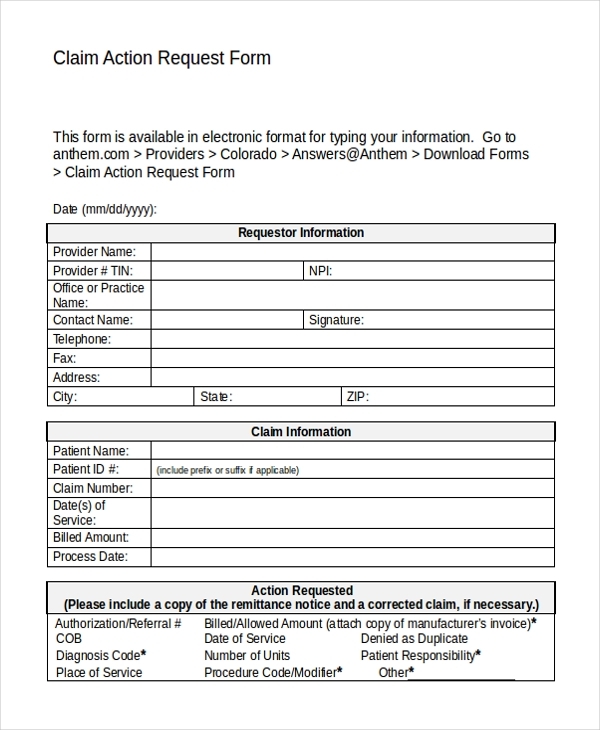 This form is usually used by insurance companies to allow their customers to request for a claim action. The customer is asked to fill in this form with the relevant details and then select the action that he is requesting for. This form is used by government agencies to allow the citizens within their jurisdiction to raise a complaint against some problem and then suggest an action plan as well. This action plan form comprises of all the requisite segments that should be included in such forms. You may also see Sworn Affidavit Forms. 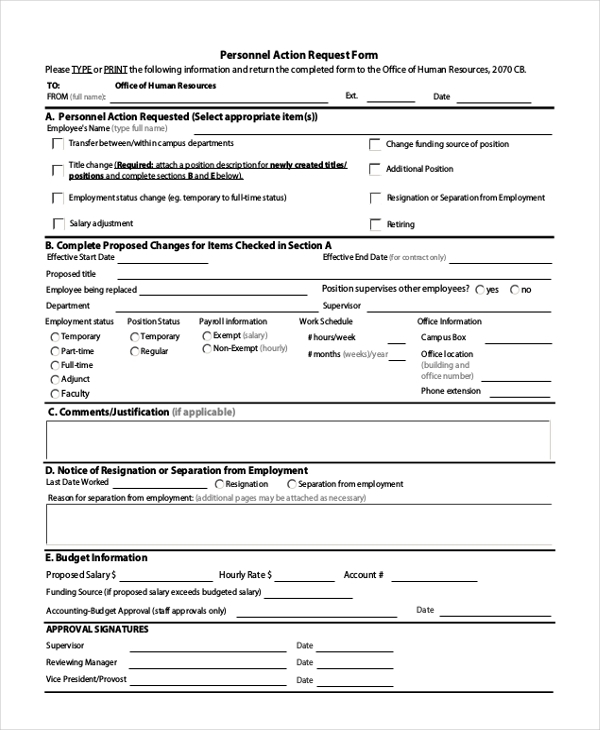 This form is used by the administrative department of various organizations to allow people to request for certain actions within the means of the department. The form lists all the actions and the user just needs to select the apt one. As the name indicates, this form is used by educational institutions to allow its students to raise a request for certain action to be taken against a problem or concern they may have. The student can put in the complaint and then select the action listed in the form. You can also see Sample Room Agreement Forms. This form is used by construction contractors and companies to allow their customers to raise a request for a slight alteration or correction of the existing design. With all the required segments in place, this can be done quite easily. This form is used by business organizations to allow their customers to request for certain action to be taken against the complaint or concern they may have against the products or services of the organization. You may also see Corrective Action Forms. 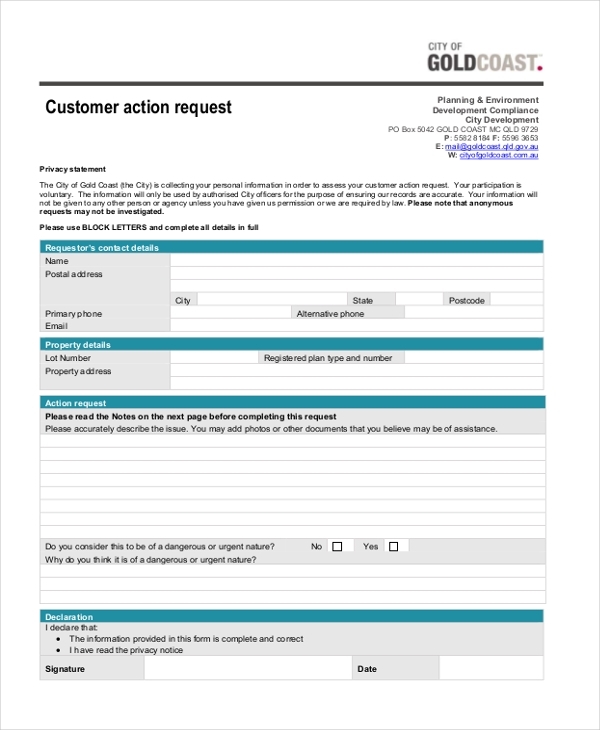 What are The Benefits of Using Action Request Forms? 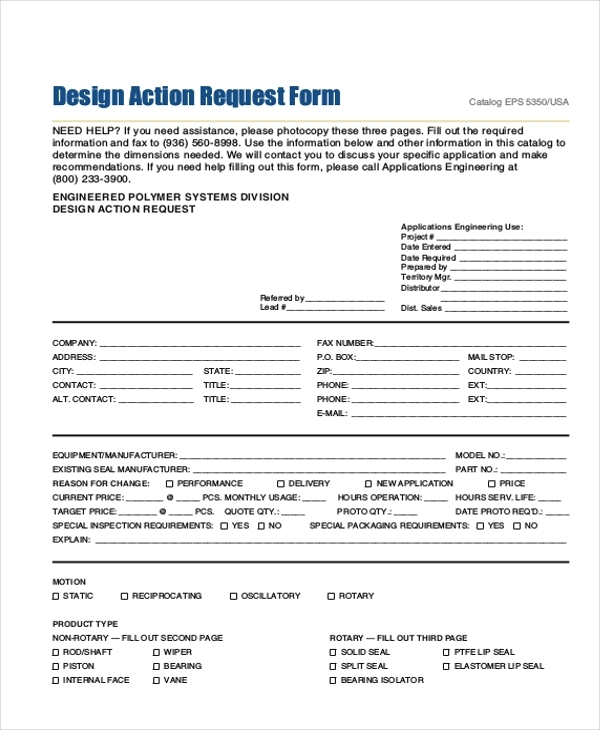 Not sure how to design an action request form? 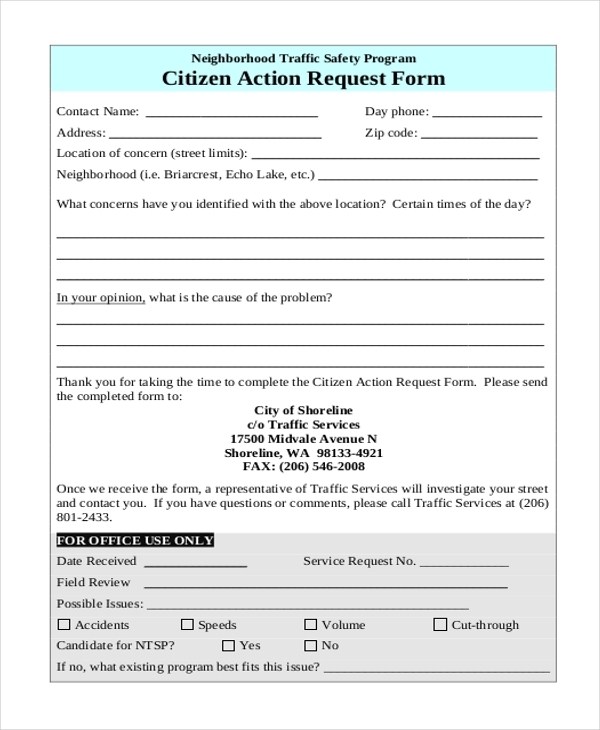 Get some ideas by checking out our collection of action request forms. With a wide range of forms to choose from, you are sure to find the one that is perfect for you. Download this and then customize it as per your needs. Using these forms helps you to come up with a unique form in a jiffy. You may also see Disciplinary Action Forms.